More and more people use VR to play games,Familys or friends may sharing a VR when playing games. But this is likely to cause skin infections.Sweat and grease penetrate into the foam easily lead to odor. How to solve this problem?This is what we do. We use a replacement foam with disposable mask. We use medical non-woven fabrics as raw materials.keep the sweat and oils off.so there is no skin infections and stink.you can always use a new one every time.No more worry about the sweat and sharing your VR. 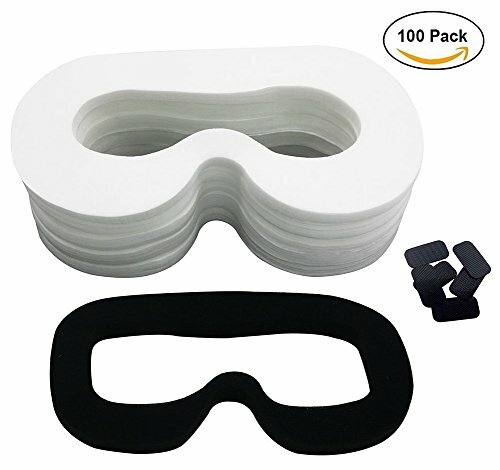 Say goodbye to wipe your VR with alcohol cotton,come and get your convenient foam. HIGH QUALITY FABRICS:Face cover use medical non-woven fabrics as raw materials,Effectively prevent sweat, oils get through into the foam, avoid breeding of bacteria,stink.Thus provide better protection for your HTC VR.